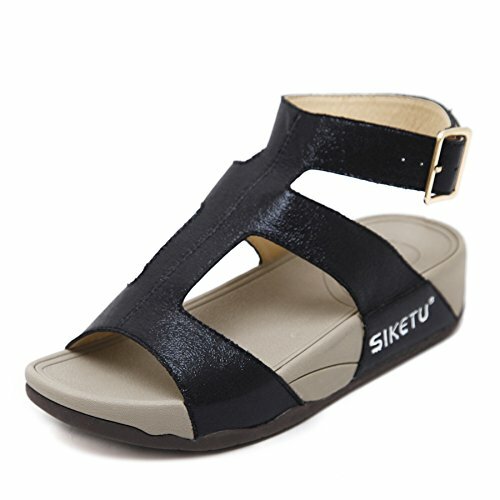 The fashionable shoes has adjustable ankle strap with buckle closure. The BEST choice for your vacation,travel daily and almost at any casual occasion and as a gift for your close friend/girlfriend/roomie as well. 2 colors available : black and gold. Please choose the size according to your foot length.If you are not sure, please feel free to contact us. We can give you suggestion. Customer service is our KUONUO NO.1 priority. If you have any question or suggestion, please feel free to contact us. We will be happy to handle your issue ASAP. We offer refund within 30 days and 100% exchange with no hassle! Your opinion and support is very important to us! Order now and ship right away. Fashion & Comfy! Check our chart to find the right size for you. For various feet, please choose bigger or smaller size. (Refer to our SIZE CHART on picture) MATERIAL : Upper Material: Faux Leather; Lining Material: PU;Rubber sole DESIGN : Stylish Vamp,Platform Wedge Low Heel Sandals,Metal Buckles,Soft Rubber Sole,Open toe,Adjustable Ankle Strap HEIGHT : Heel height: 0.4" (approx),Platformheight: 1"(approx) Occasion : Casual,Daily,Work,Vacation,travel and can pair with any color clothing for Fashion Women, Elegant Ladies & Trendy Girls.